These are my proudest moments. Cooking vegetables crisp-tender, lightly salted with bright vinegar and rich butter, is like a music montage makeover, the equivalent of removing big glasses and drawing the bangs from their shining face. However, faced with beet greens, I thought I was beaten. The purring I’d hear while rattling off ingredients for my weekly cooking demo – Asian pears, cauliflower and blue oyster mushrooms – would end in a full glottal stop at the mention of beet greens, grins turning to grimaces. I moved ahead, inspired. 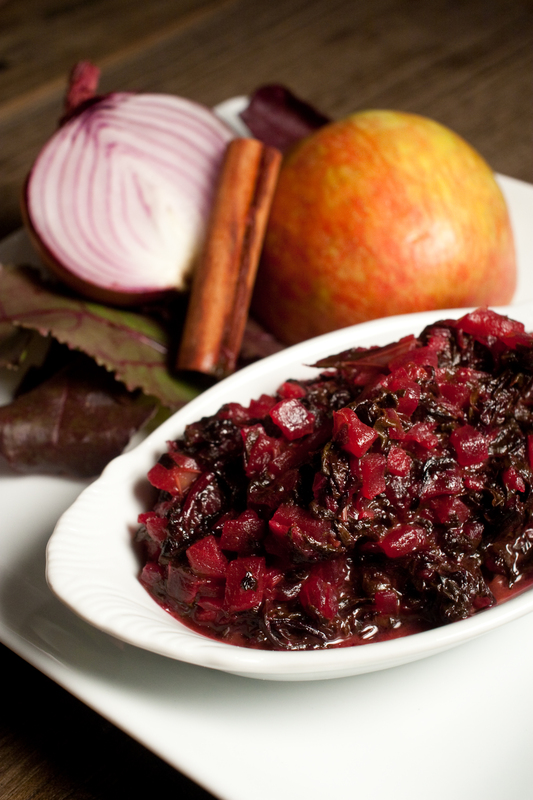 Tender, young, deep crimson Bull’s Blood beet greens were earthy-sweet, reminding me of my Mom’s braised red cabbage. Chopped apple and cider drew out sugars while cinnamon and fresh ginger added bright warmth. The ultimate test was my friend Michael. Who, after three days of urging, finally, standing at my Eastern Market demo, took a bite. “They’re not bad,” he offered. Then he cleaned his plate. PS I love Brussels sprouts. A lot. *Grab Bull’s Blood beet greens from Gardener’s Gourmet at Eastern Market – they’re the folks who always have beautiful greens out in fun, metal tubs. Autumn Apple vinegar, from Sapore, is indispensable in my Fall pantry. Heat butter and olive oil in a 3-4 quart saucepan over medium low heat. Sauté onion until soft, about 3 min. Add apple, and sauté for 4 minutes. Add beet greens, Autumn Apple vinegar, cider, cinnamon stick and ginger. Cover and cook until beet greens are tender but still firm, about 5 minutes. Uncover and cook until liquid reduces, another 3-5 minutes. The greens will give up a lot of moisture as they wilt. Season to taste with salt, pepper and additional vinegar as needed. What would you do with more time? Do you have a stack of unread issues of the New Yorker, or trail maps to the 48 peaks over 4000 feet in the White Mountains? Though a cold blessing, many people working in DC and around the country, currently have some time to answer this question. My answer is simple. I would cook. I would braise and bake, make stocks stews and sauces, I would preserve and tackle all those time consuming cooking feats that currently escape my hectic schedule. Recently, I decided to just go for it. Enamored by the thought of using the local harvest of Asian pears in a marinade, I decided to braise a bone-in pork loin roast. The sweet, earthy pears paired perfectly with salty, delicate Tamari soy. I ground in some of the bold, floral Szechuan peppercorns I had been playing with recently, along with bright, fresh ginger and sweet maple sugar. My first attempt, 12 hours in the marinade and 10 in the oven, produced tender pork lacking flavor, It tasted much better after a night in the fridge. Already a two day recipe, I figured I had already crossed a line and headed right back in to the kitchen. On Monday, I patted the bone-in pork loin roast with a blend of salt, peppercorns and maple sugar for an overnight dry marinade. Tuesday morning, I added the liquid ingredients to infuse throughout through the day and night. Wednesday morning, I seared the pork and braised it in a 200 degree oven for 10 hours, then cooled it to room temperature so it could sit in the fridge overnight, taking on even more flavor. Thursday, after returning home from work, I skimmed the fat from the surface of the marinade. Shredded the meat, tossing it in the thickened sauce and served it with an Asian pear slaw and bao bing, the thin Chinese pancakes served with mù xī pork. The result? Four days of cooking, requiring less than two hours of work is worth every minute. The flavors are complex, sweet and grounded, everything you want from cool fall days that aren’t yet winter. If your unwillingly at home from work, my thoughts are with you. May you find joy in the kitchen. Now is the time. *You know what makes this taste even better? The Lemongrass-infused rice wine vinegar and Wasabi Sesame oil from Sapore. I’m totally obsessed. The Wasabi Sesame oil is well worth an online order. Give them a call and they would be more than happy to ship you a bottle of Szechuan peppercorns too! Dry rub: Mix together Szechuan peppercorns, maple sugar and salt. Rub mixture into surface of pork roast and place in the fridge overnight. Make the marinade: Puree Asian pears in a food processor. Add soy sauce, rice wine vinegar, sesame oil, garlic and ginger and purée. Add pork shoulder to marinade, cover and refrigerate for 24 hours. Braise the roast: Pre-heat oven to 200. Remove pork from marinade, pat dry, and sprinkle with salt and pepper. Warm oil in a dutch over medium-high heat. Sear pork on all sides. Add marinade and bring to a boil. Cover and place in oven and cook for 10-12 hours. Check every four hours to make sure you aren’t losing steam from your dutch oven. Add hot tap water to replace the liquid level as needed. 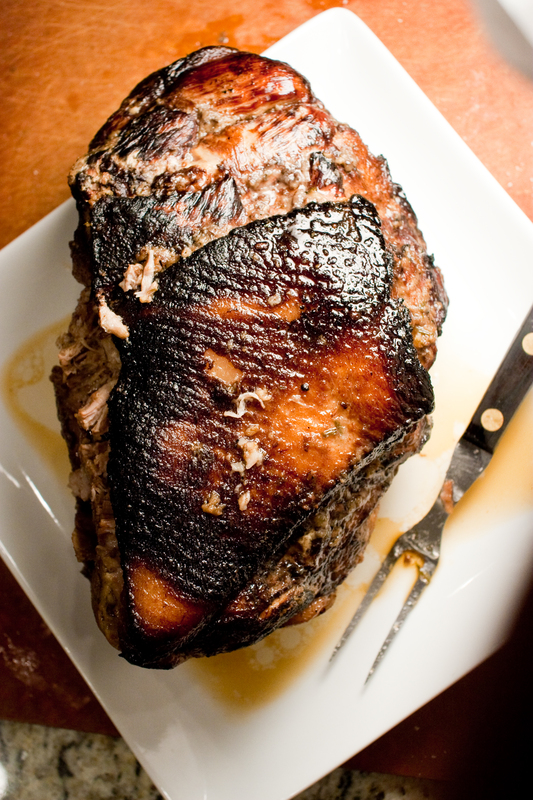 Rest the roast: Remove pork from oven, let cool and place in fridge for 4 hours or overnight. 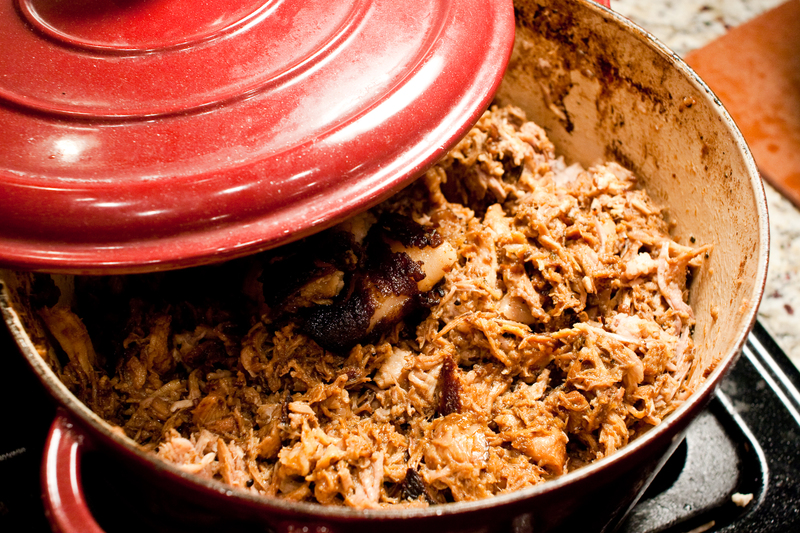 Shred the pork and finish the sauce: Skim fat from surface and reheat pork on the stove. Remove pork and shred. Strain the cooking liquid, reduce to a thick sauce and toss with pork. Grate the Asian Pears the medium sized holes of a box grater. Whisk together soy sauce, rice wine vinegar, sesame oil, honey and ginger. Toss Asian pear with dressing and let sit for 5-10 minutes before serving. The pear will wilt over time, so dress it no more than 20 minutes before serving. Add 3/4 cups boiling water to flour and stir together in one direction with a chop stick or spoon. Add additional water as needed for a slightly tacky dough. Turn the dough out onto a well floured surface and knead for 3-4 minutes until smooth. Cover and let rest for 20 minutes to an hour. Roll the dough into a 1/2″ thick “snake” and cut into 2″ pieces. Roll two pieces of dough into separate 3″ circles. Brush the top of each with sesame oil, and place the oiled sides together. Roll the pancakes out into 6-8″ circles. Warm a skillet over low heat. Add pancakes to pan and cook until brown spots appear, about 2 minutes. Turn and finish cooking, about 1 minute longer. Remove from pan and separate pancakes. Sometimes it take a little work to get them started. Keep warm by covering with a towel. 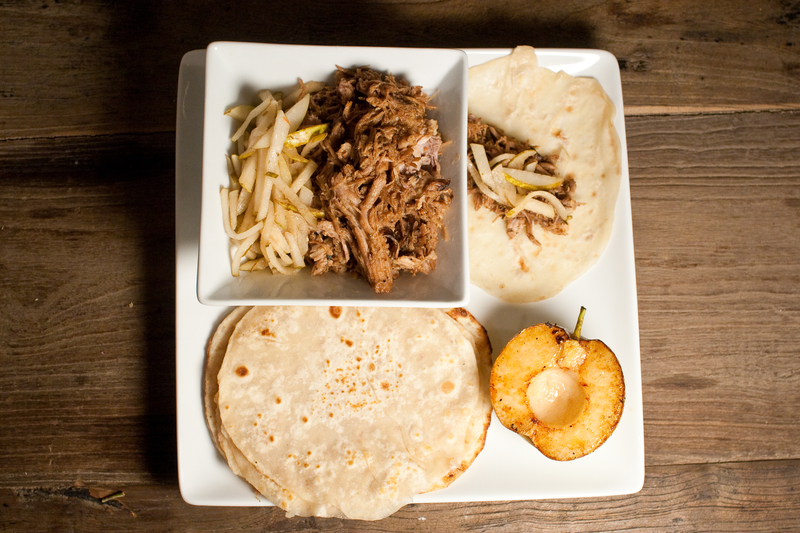 Serve pancakes with shredded pork and Asian pear slaw. 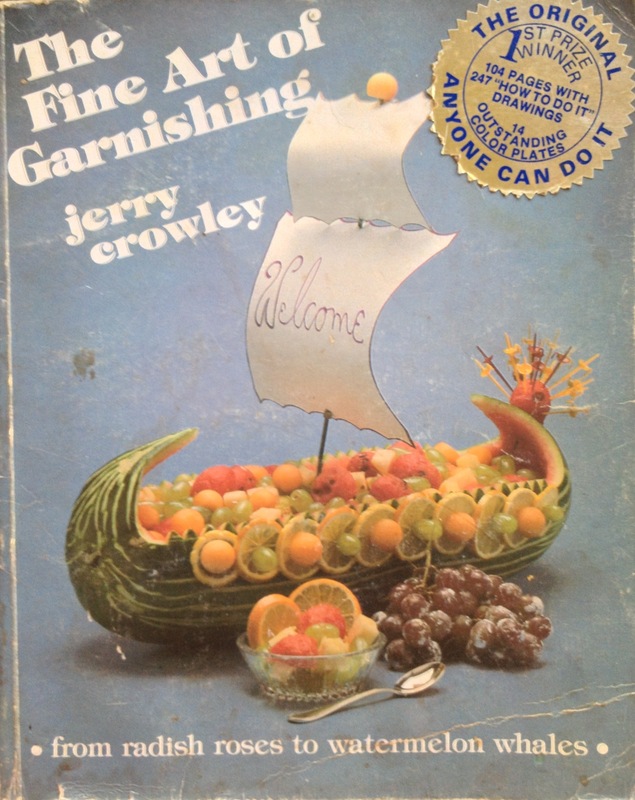 The first cookbook I ever bought with my own money is titled The Fine Art of Garnishing. It came packaged with 5 small tools which enabled me to turn a radish into a rose, an apple into a bird, and, most importantly, carve a watermelon. For one summer cookout after another, I carved watermelons to serve fruit salad. Family photos reveal watermelons carefully crafted to resemble whales, Viking sailing ships, and baskets. We’d scoop out the watermelons using a melon baller, and toss the fruit with cantaloupe, honeydew, peaches and berries. While I still love a good fruit salad, there are meals when I want my watermelon dressed a little more elegantly. The savory flavors of bright vinegar, bitter greens and sharp cheese balance delightfully with sugary fruits. They are the perfect companion to anything smoky and charred from the grill. I suppose, if you’re going to use such sophisticated ingredients, you should probably present them more formally. May I suggest a watermelon? 2/3 cups olive oil – the good stuff! *Cava Rosé is a wonderful summer introduction from our friends at Sapore. I paired it with Koroneiko, a light, grassy, Greek olive oil. Toss together watermelon and arugula in a large bowl. In a separate bowl, whisk together shallot, vinegar and honey. Whisk olive oil into vinegar mixture to form a thick, creamy emulsion. 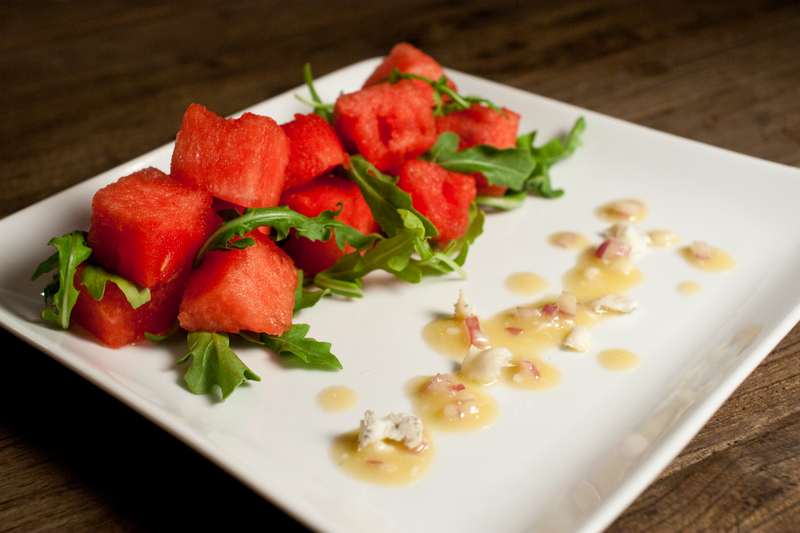 Stir cheese crumbles into vinaigrette and taste with a cube of watermelon. 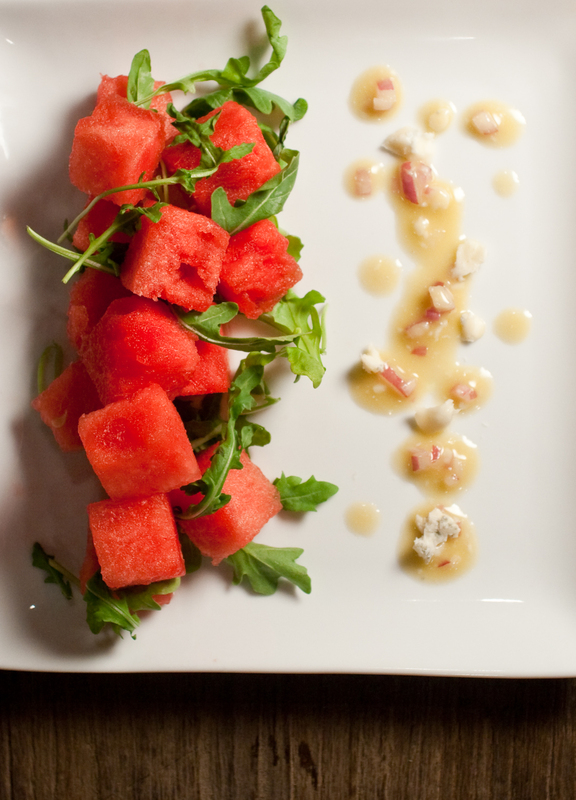 Season dressing to taste with additional salt, pepper, vinegar or oil and lightly dress watermelon and arugula. If making this ahead, keep the watermelon separate. It will release water which will dilute your dressing and wilt the arugula. Have I mentioned my book? My husband Jason and I received I a picinic “basket” as a wedding gift from our friend, Jess. The vintage suitcase arrived, filled with beautiful, reclaimed flatware and serving ware, linens and wine glasses. Like Jess, it is fabulous-casual. You know, like those friends who roll out of bed, pull on whatever clothes lay about their feet, and end up looking like the cover of Vogue? Now I needed a dish as fabulous as the picnic case. Something that we could serve with a bottle of sparkling rosé, sipped by ladies in gloves and men wearing hats and suspenders. Et voilà, I succeeded! 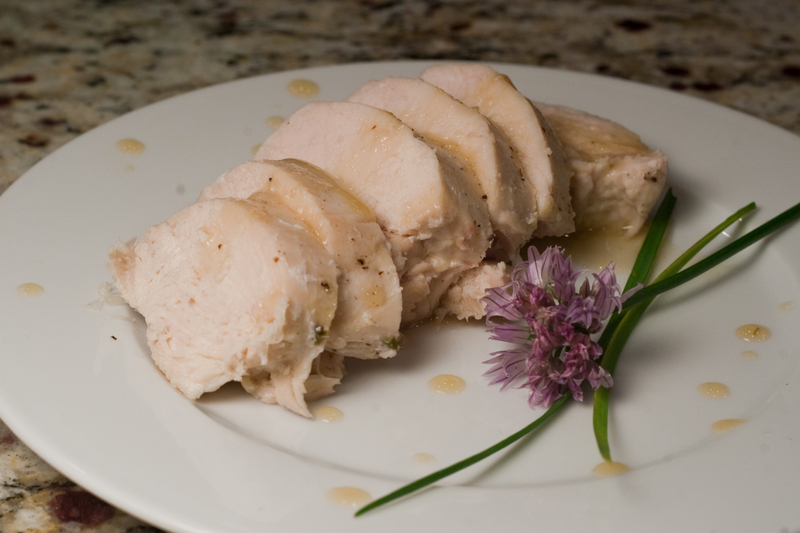 This herb-poached chicken is perfectly moist. 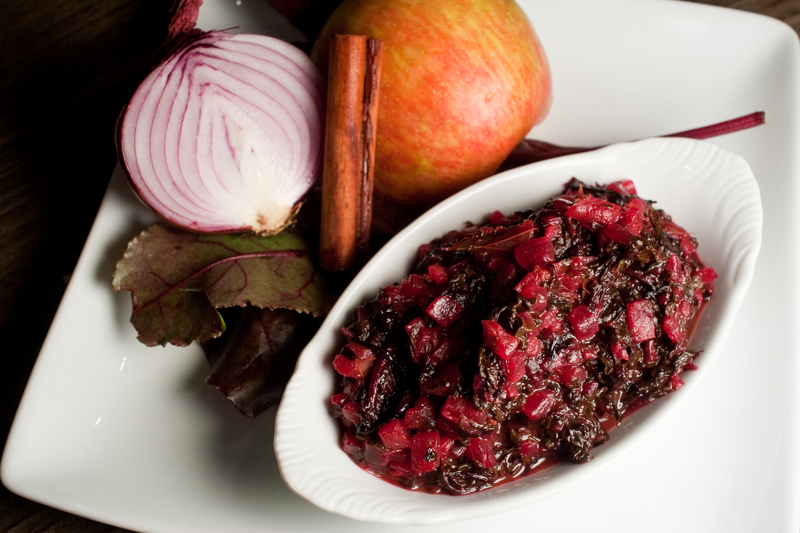 The dry wine, peppercorns and bay ground a beautiful sauce. It’s made slightly sweet by the chicken, tarragon and butter. Cook it ahead and serve it cold with cucumbers dressed in Merlot vinegar, French potato salad and slices of sweet, clean, white peaches and nectarines. Now I just need a hat. *I was recently advised that I needed to get comfortable with shameless self-promotion in order to sell my upcoming book, Simple Summer: A Recipe for Cooking and Entertaining with Ease. Here’s one of the recipes. I hope you enjoy it. How was that for shameless? *Sightly sweet and beautiful balanced, the mild acidity of Sapore’s Champagne Mimosa vinegar brightens this dish and many summer salads without overpowering the fresh ingredients. 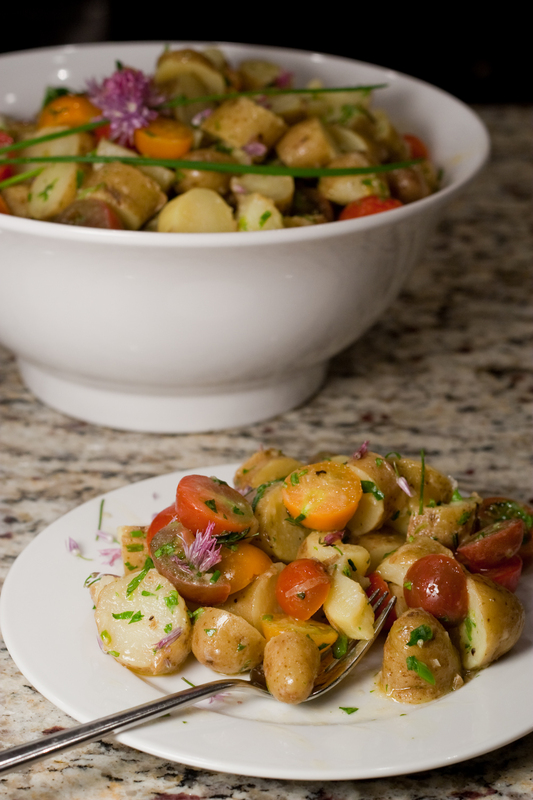 Serve light-tasting French potato salad with this white wine, herb-poached chicken. Warm oil over medium heat in a large skillet. Add onion and sauté until softened and translucent, about 6-7 minutes. Reduce heat if needed, to cook onions without browning. Add garlic and cook two minutes, until fragrant. 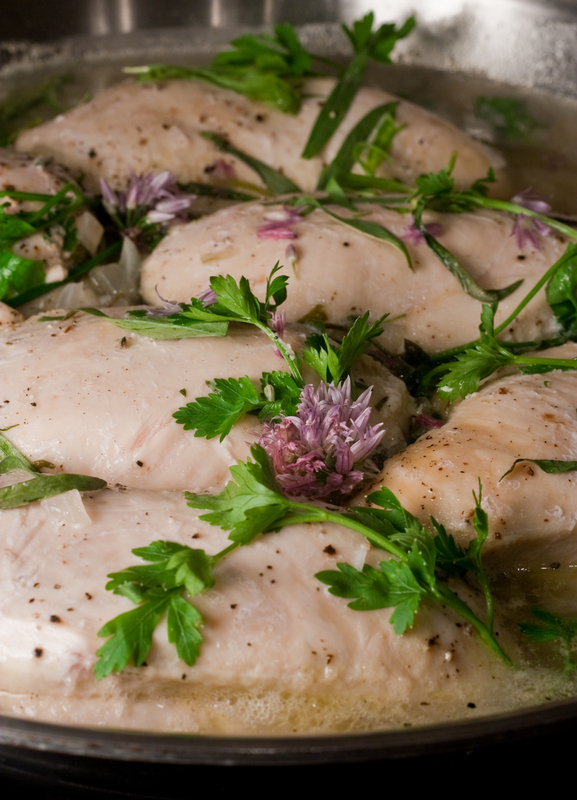 Place chicken breasts in pan in a single layer. Tuck herbs between chicken. Mix together wine and stock, and pour into pan. Cover pan and bring to a simmer. Cook chicken for 10-15 minutes until done, 165 degrees. Be careful not to let poaching liquid boil. Remove chicken to a platter and tent with foil. Add peppercorns, bay leaves and vinegar to pan and simmer until reduced by half. Strain sauce, discard solids and return liquid to pan. Add any juices that have collected under the chicken and cook until reduced to 1 cup. Remove sauce from heat and whisk in butter to thicken. Serve warm or chill and serve cold. Either way, don’t forget the sauce. Mom was very, very right. When Mom said we were having a vegetable for dinner – say zucchini or green beans – it was, typically, just that. They were steamed, seasoned with salt and pepper, and possibly tossed with fresh herbs, usually parsley or basil from the garden. If Mom felt the rest of the meal was sufficiently healthy, she would add a small pat of butter. This, it turns out, is a fabulous way to serve almost any vegetable. 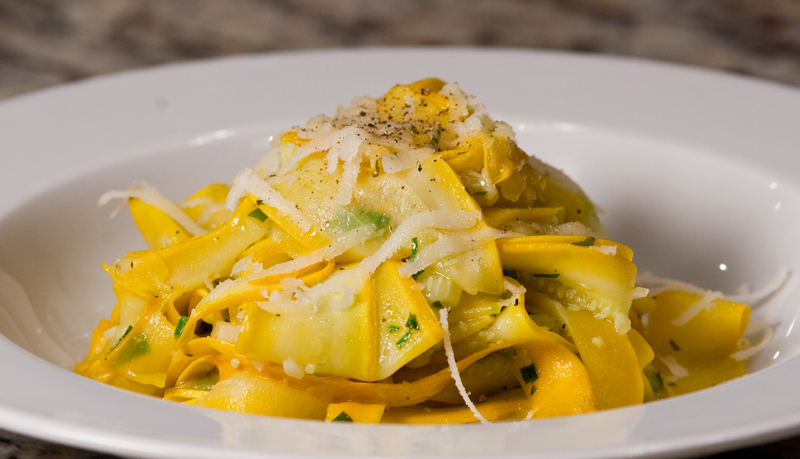 The long strips we quickly shaved with a vegetable peeler resembled wide pappardelle noodles. Cooked over low heat to keep the flavor light, we tossed in garlic and a splash of lemon juice, fresh basil and a grating of Parmesan cheese. We then made another batch, arguing that we should probably try adding fresh tomato. Our third panful confirmed it was actually fine without the tomato, and the fourth we needed for a photograph. We are currently planning future batches to serve under chicken piccata and shrimp scampi. You know, just to be on the safe side, I going to retract any admission that I was wrong. Let’s simply say my Mom was very, very right. Warm 1 tbs olive oil over medium heat in a 12” skillet. 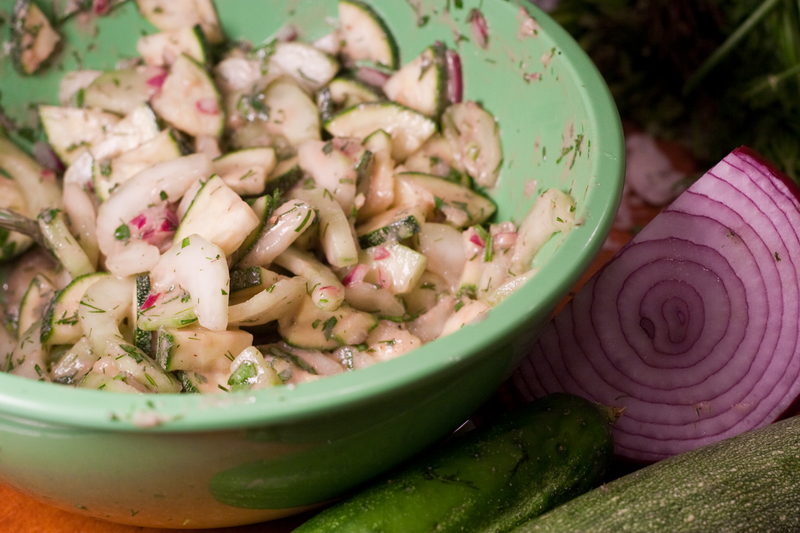 Add zucchini and sauté, turning often with tongs, until beginning to soften, about 3 minutes. 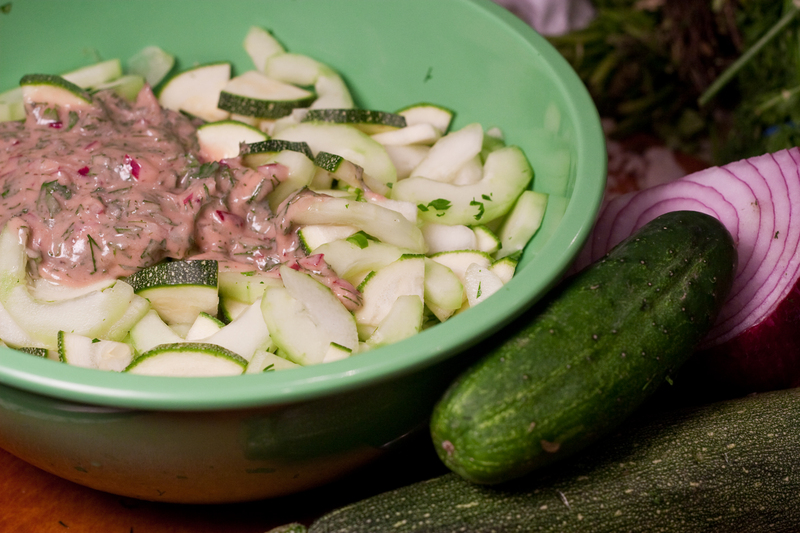 Add garlic and cook until zucchini is softened, about 3 minutes longer. In skillet, toss in parsley, basil, lemon juice and remaining 1 tbs olive oil. Remove from heat and season to taste with salt and pepper and serve topped with freshly grated Parmesan cheese. Norman Rockwell drew an illustration for the Mass Mutual insurance company titled “Cookout.” As mothers and children set the picnic table, fathers hover around the grill. Nowhere is there any food. But imagine, give me your very best Family Feud guess as to what will appear on those quintessential American plates. Burgers, of course, and corn on the cob. What’s on top of those burgers? A single square of cheese melting into the smoky, crevices in the beef patty. Theres a plate of iceberg lettuce available for topping, and if it’s a really good day, mom has fried up some bacon. This burger, then, is not so far from American tradition. The corn, off-the-cob and tossed with bacon, tops the burger. Baby spinach replaces lettuce and our cheese is upgraded to a far-more-American cheddar. It’s fun, delicious and a little creative. Maybe that’s why Mr. Rockwell left the plates empty. There’s nothing more American than taking traditions, making some changes, and making them our own. 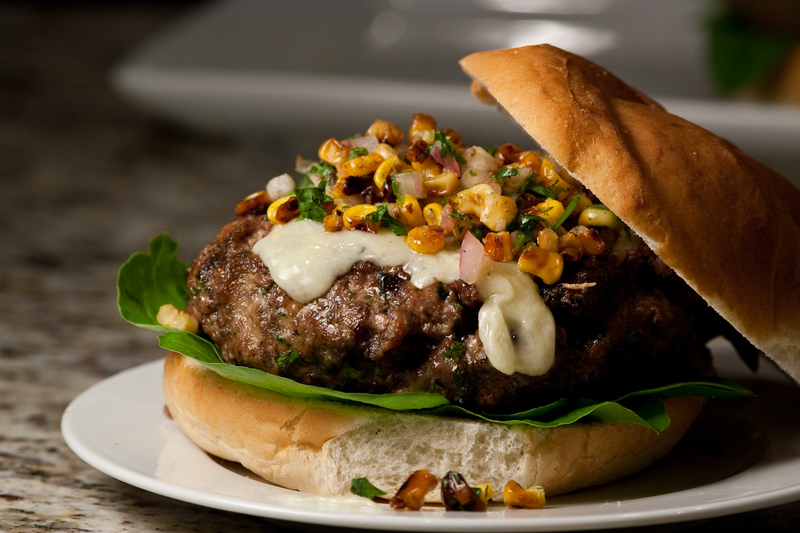 Using beef with some fat makes this burger rich and moist. These are big burgers and could certainly be made into 6 smaller patties. Mix together ground beef, bacon, eggs, parsley and cilantro. Season with salt and pepper and form into four large patties. Heat your grill to medium-high and grill your burgers just off to the side of the coals. These are big patties, so you’ll probably cook them for 5-7 minutes a side for medium rare. Place a slice or two of cheese on burgers 1 minute before removing from grill. Layer bun bottoms with arugula and burgers. 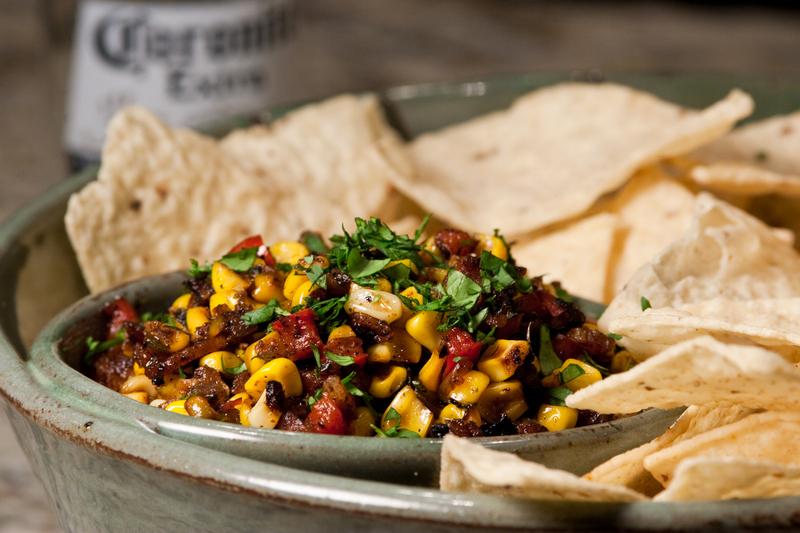 Top each with 1/4 cup corn and bacon salsa and bun top. If there’s not juice running down your chin, you’re doing it wrong! For a nuttier, toastier flavor, toss corn kernals with 1 tbs olive oil and 1/4 tsp cumin and roast in a 400 degree oven until golden, about 7-10 minutes. Add right before seasoning the salsa. Serve this over grilled, cumin-lime marinated chicken or with chips. *Where do you get Roasted Red Pepper Blackberry vinegar? Sapore, of course! You can order online too. Fry bacon in a large skillet over medium heat until browned on both sides. Remove from pan and dry on paper towels. Leave 2 tbs bacon fat in pan. Return heat to medium and add red onion. Cook until softened. Add red onion and jalapeño. Sauté 3 additional minutes. Add raw corn, increase heat to medium high, and cook for 3-5 minutes until edges of corn turn golden. Stir in cilantro, cumin and chili powder. Remove salsa from heat. Chop bacon and stir into salsa. Season to taste with a splash of vinegar, salt and pepper. Add additional cumin or chili powder as needed.